Diary of a TeenAged Saudi Boy: Abducting Iranian Pilgrims In Syria, Why??? 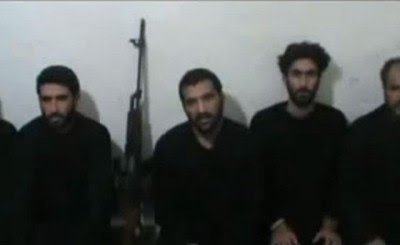 The photo shows the five Iranian engineers kidnapped in the Syrian city of Homs on December 21, 2011. 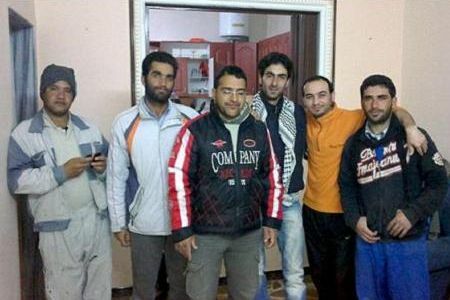 The second man on the right is their Syrian cook. An image from a video posted on the internet on January 26, 2012, showing the Iranian pilgrims held hostage by armed gangs in Syria. A group of armed militants have attacked an Iranian bus on the road connecting the capital, Damascus, to the northwestern city of Aleppo, Press TV reported. The incident occurred on Thursday when a bus carrying Iranian pilgrims was stormed by unidentified gunmen. The assailants kidnapped 11 men and drove off to an unknown destination, leaving the female passengers in the vehicle. The gunmen contacted the relatives of a kidnapped passenger in Tehran, confirming the abduction of the Iranian nationals and demanding a ransom. The First reason that comes to mind as to what was behind these kidnapping is " pressuring Iran " and the Iranian Pubic ,..
and who did this is kinda an alien to the Moslim/Arab/Persian Pride; it's one and the Same by the way ,. People in Bahrain and Saudi Arabia are being killed everyday, the whole world is watching and saying nothing, women and children are being violated with the help of British and American " torture/well-Breakage experts ,.. but, the people are as firm as ever and are more determined. so why are these kidnappings and what are they meant to accomplish???!!!! This usually works for foreigners and leisure tourists, but will NEVER work for Religious tourists,.. 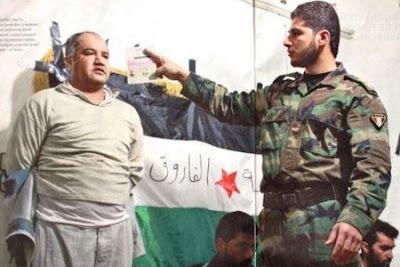 They even exposed members of the so called " Free Syrian Army " who claimed to be of active service and ran away, it showed them a month or so earlier as teachers, grocers, convicted villains and as such ,..
and That's why the video showing The Iranians saying that " they are members of the Iranian military ", Iran and Syria retaliated swiftly and showed them at work at some different time intervals which hit the plan in it's core and discredited the abductors stories, and proved that these were forced false statements ,..
"The writing in Arabic is meant to hit a sectarian nerve " ,.. more of what would an international intelligence agency would do ,.. Iranian Shias are kidnapped by hero sunnis ,.. got CIA/Mossad written all over it. 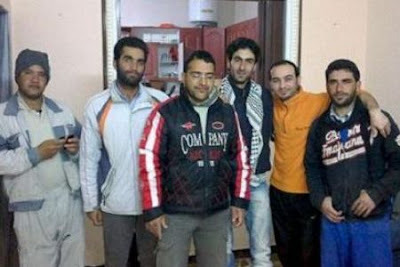 A file photo showing five Iranian engineers kidnapped in Syria. The 2nd man on the right is their Syrian cook. and Note the figures of the engineers,.. is that how you would picture or view a member of the elite combatant Highly trained, special forces of the Iranian Revolutionary Guards ??? absolutely not ,..
Why don't I think that these kidnappings are not for ransom " needed money " for example?? That's the cover of the book of the plot ,.. so if some money came out of it,.. they will take it ,..
but why then show the face of one of the Kidnappers ?? go back to number two ,.. It's a message ,.. we are in control,.. we are brave, and don't forget about the Sectarian aspect of it,..
to start connecting the two groups, and say,.. hey,.. these are those ,.. these are terrorists ,..
and what backs this up, is that ,.. these pics were first published by a German News paper,..
meaning ???????????? it was meant for audiences out side the region,. it is meant for Europeans and Americans ,..